This unit is the size of a small walk-in closet. This unit is offered with a 3’ wide swing door. It is about 10’ tall inside and is great for stacking boxes. This unit is the size of a full Walk-in closet. This unit is offered with a 3’ wide swing door. This unit is the size of a small backyard shed or a very small bedroom. 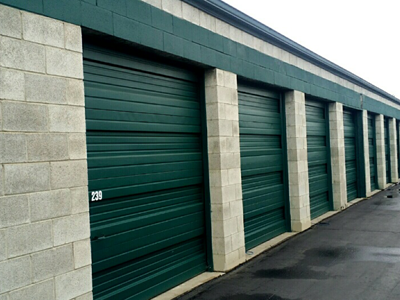 This unit is offered with either a 3’ wide swing door or an 8’ wide garage door. This unit is the size of a standard one car garage. It comes with an 8’ wide door. This unit is the size of a large single garage. It comes with an 8’ wide door on BOTH SIDES! This unit is perfect for accessing items from either side. This unit is the size of a double car garage. It comes with a 10’ wide garage door. It is perfect for storing RV’s and boats. Or For extra inventory space for your business. The garage door is approximately 11’ tall, the unit is 15’ tall inside. This unit is the size of a two-car garage. It comes with a 10’ wide garage door. It is perfect for storing RV’s and boats. Or For extra inventory space for your business. The garage door is about 11’ tall, the unit is 15’ tall inside. Put the items you need to access frequently at the front of the unit. Prepare a map of your unit so you know where you have stored items. Cover your furniture, mattresses, box springs with covers designed for them. Use blankets and towels to cover furniture. Use your refrigerator to store things inside. Be sure to leave the door open slightly so air will circulate. Make sure that all loose parts in your refrigerator (including ice containers and drawers) are secure. Any exposed coils should be padded to protect them during the move as well. Leave a little space between your items and the walls, so air can circulate. Also, leave an area where you can walk to the back of your unit, so you can access items. Remove all fuel from lawn mowers or other gas powered equipment. Your move will be easier and smoother if you pre-plan your packing! - It always makes good sense to begin packing well ahead of the move. - We strongly recommend that you use good quality, strong moving boxes, and always be certain that the bottoms are fully secured. - Don't get overwhelmed. Try to concentrate on one room at a time. Be sure that every box is clearly labeled by room and item. - Once your moving boxes are filled, they should be placed in an area close to your front door. When disassembling your bed, use tape or rope to bind the frames together. Your drawers should be filled with wrapped items or clothes. Entire drawers should be covered with a blanket or old linens. You shouldn't tape the drawers shut - the finish on your drawers may be damaged. Cover your tables with a blanket or old linen. When possible, remove the legs. Always wrap the nuts and bolts in a plastic bag and secure them to a leg. Check your owner's manual for any special moving instructions of appliances. In order to keep the tub of your washing machine from moving around during the move, fill it with stuffed toys, blankets, towels, and old linens. We offer Specials that make our competitive rates extremely attractive. We don’t require a security deposit. We do have a $10.00 administration fee that can be waived if you sign up for automatic payment with your credit card. We encourage everyone to stop by and take a tour with our friendly and knowledgeable manager. We will analyze your specific storage needs. We offer a fenced and gated property, an on-site manager, 24-hour access (upon request) and more. Please inquire directly for pricing and current specials. based on what you are storing. Use our “sizing guide” as a reference. We have small units (5X5) to large garage sizes (12x40). Our standard access hours are from 6 a.m. until 10 p.m. 7 days a week, even on holidays. We can provide 24-hour access to licensed businesses that need it, upon request. What are our office hours at Valley Self Storage? Our site is fully fenced and well lit. You will have your own special access code (which you will select) so you will be able to enter the access gate. We have over 20 video cameras throughout the property that provide surveillance. Our manager lives on-site and keeps an eye out for anyone in the facility after hours (using security cameras). The gated access allows only those with an access code to enter. Our gate software keeps track of everyone who enters and leaves the property, so we always know who has been coming and going. Yes, we have a wide variety of boxes in several sizes along, with other packing supplies. We sell mattress covers, tape, utility knives, magnet lights, rope, gloves, batteries and much more, all at discounted prices, in the office. Do you have any Customer Referral specials? Hazardous and toxic materials are strictly prohibited. This includes petroleum products, acetone, etc. If you have any questions about certain items, please check with the manager. Yes. If you need a moving trailer, we have one available for free when you rent a unit. We require a copy of insurance, and a $150 security deposit, returned once the trailer is back. Please call for details, 509-924-8467.